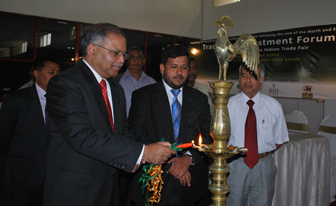 The Trade and Investment Forum organized in concurrent to the Indian Trade Fair was inaugurated on 13 August 2010 at the Sri Lanka Exhibition and Convention Center amidst the presence of Chief Guest H.E Ashok Khanta High Commissioner of India, Guest of Honor Hon. Rishad Bathiudeen Minister of Industries and Commerce, distinguished invitees and a large number of local and Indian investors. 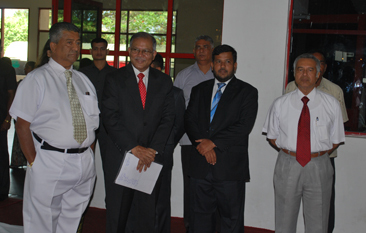 The Federation of Chambers of Commerce and Industry of Sri Lanka (FCCISL) together with the assistance of the BOI, EDB, Department of Commerce Sri Lanka Convention Bureau and Pico Events organized the forum to focus on investment opportunities in Sri Lanka consequent to the end of the North and East conflict and in order to create a gateway to re-establish and pursue novel trade links whilst creating a platform to discuss future business opportunities. An array of eminent speakers from the BOI, EDB and Department of Commerce made presentations highlighting key areas of economic collaboration between the two countries, aiming at striking new partnerships. Mr. Tissa Jayaweera senior vice president of the FCCISL in his welcome speech referred to India’s keenness in developing trade relations between the two nations, thus opening up new avenues of trade in Sri Lanka. He also extended an invitation to Indian industries and businessmen, to explore all available opportunities aimed at promoting economic linkages between the two countries, through enhancement of bilateral trade and investment. H.E. 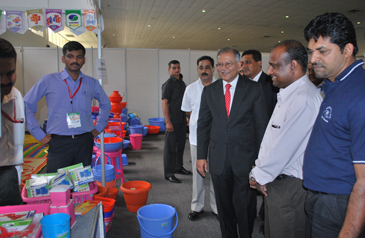 Ashok Khanta in his address mentioned that the economic atmosphere in Sri Lanka has attracted the attention of Indian industry and investors and that the exposition and forum will provide an excellent opportunity for establishing solid business links between the two countries. He also emphasized on the fact that Indian Consulates will be established in Jaffna and Hambantota in order to further facilitate efficient and trouble-free procedures for those envisaging traveling to India on business and pleasure. The High Commissioner also stated that arrangements are in place, in order to issue business Visas on the same day of acceptance. He dispelled doubts cast on the CEPA agreement by certain business sectors in Sri Lanka and assured that the agreement would not be detrimental towards trade in general and to the Sri Lankan business community. Hon. Rishad Bathiudeen in his address stressed that Sri Lanka’s future strategy with respect to India is to promote stronger bilateral ties and harmony between the respective business communities and that the country has the advantage to model itself as a “back-up” centre for India and reaping the spin-off benefits afforded from Indian technology. The minister also highlighted the new opportunities that have been created following the end of the conflict, with stronger bilateral trade ties and emerging new markets. He also confirmed that the government of Sri Lanka will look into all aspects concerned, with their counterpart in regard to the implementation of the CEPA agreement. 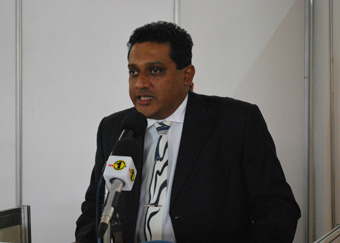 Export Development Board Chairman Janaka Ratnayake said that the Indo-Sri Lanka Free Trade Agreement has provided a big boost in bilateral trade relations between the two countries and that trade has grown rapidly between the two neighboring countries. Mr. Ratnayake also mentioned that Sri Lanka is India’s largest trade partner in SAARC and that India in turn, is the largest trade partner of Sri Lanka globally and that the Indian element has always been a vital component in the Sri Lankan market. Dr Thusitha Tennakoon, Secretary General FCCISL made the Vote of Thanks. The forum sessions were well attended with over 50 local businessmen and Indian businessmen/investors. The sessions highlighted export opportunities under ISFTA and beyond, emerging business opportunities for investments and developing market linkages for products. Mr. Gomi Senadhera, Director General, Department of Commerce, Mr. C Ignatius, Director promotions, Board of Investments of Sri Lanka and Mrs. Jeewani Siriwardene Director, Export Development Board were the resource persons for the above mentioned sessions. Excellent feedback was received by the participants with regard to business opportunities generating from the trade fair and also relating to the investor forum.